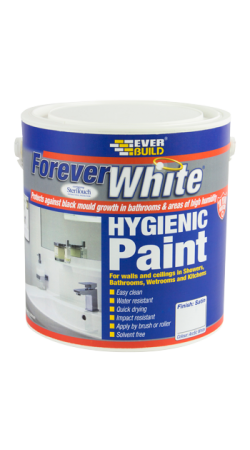 Forever White Hygienic Paint is a highly durable, long lasting, moisture resistant paint with antibacterial protection for walls and ceilings in areas of high humidity such as showers, bathrooms, wetrooms and kitchens. It is fast drying, two coats can be applied in one day, and dries to an exceptionally hard wearing and impact resistant finish that resists cracking and flaking. Ideal for use in areas of high humidity, can be applied to most common substrates including concrete, bricks, blockwork, renders, cement based and gypsum substrates, metallic surfaces, timber, plastic, plus over ceramic tiles and painted surfaces.